Posted February 7, 2017 by Christian Ruoff & filed under Features, Infrastructure Features. Most major retailers require that electrical products sold in their stores undergo third-party independent safety testing and certification, Amazon does not. Currently, many charging stations that are not safety-tested and certified continue to be sold on Amazon. Have you ever researched the safety certification of an appliance before buying it? I’ll admit, I have not. Hair dryers, space heaters, battery chargers – you name it. Without ever giving it much thought, I always assume that any product sold in the US will have some basic safety certification. Typically, that’s a fair assumption, considering that most big-box retailers such as Wal-Mart, Best Buy and Home Depot require that products sold in their stores have the standard safety certifications for their category. So, Charged was alarmed to learn that many of the best-selling EV charging stations on Amazon are not safety-certified. The primary function of a charging station is to act as an electrical safety device, so there is potential for a big problem when the world’s largest online retailer is selling hundreds, if not thousands, of units that have not been sufficiently tested. With all the challenges that face the EV industry – including increasing pressure from other industries and politicians – playing fast and loose with safety is a risk that’s not worth taking. When properly designed, tested and certified, charging stations are very safe. However, they are delivering a fairly large amount of power, so if a device is defective, failure modes can include serious shock hazards and catastrophic fires. In the past decade, there have been a handful of EV garage fires in the headlines, and long before investigations are concluded and root causes identified, the public relations damage is done. Charged first became aware of this issue in early January 2017, when we watched a video produced by ClipperCreek titled “EV Charging Station Buyer’s Guide Series: Staying Safe.” The company posted the video on YouTube in November 2016 as part of a video buyer’s guide series to help educate consumers about the ins and outs of charging stations. The three-minute video explains why safety certifications are so important, and what certification marks to look for on products. The video shows a clip of what appear to be Amazon search results, and warns buyers that many of the charging stations available online are not certified. We immediately headed over to Amazon and searched for “EV Charging Stations.” On that particular day, the product that sported the bright orange “Best Seller” ribbon was the Ebusbar BEV-H02A10, sold by a company called Evmiles. The level 2 charging station – manufactured in Shenzhen, China – had an Amazon star rating of 4.4 out of 5, based on 149 customer reviews. Unfortunately, after some digging we found that the product has not been tested and safety certified by any of the accredited third-party testing labs. In fact, three out of the four top-selling options on Amazon that day were products without safety certifications. Since early January, the Ebusbar product has been unavailable and then reemerged again for sale a few times. It’s currently not listed on Amazon, but there are other charging stations for sale today that are also not safety certified. Regular Amazon shoppers rely heavily on its 5-star customer review system. And typically it works pretty well. If you’re in the market for a new book, iPhone case or office supplies, it’s a no-brainer to go with the product that has earned more stars, all other things being equal. However, as we read through reviews of Amazon’s charging station selection, it became immediately clear that customers’ reviews are woefully inadequate at filtering out products that are sporadically defective. Charging stations need to work with dozens of different vehicles from many manufacturers, and the spectrum of different operating conditions varies wildly. That’s why exhaustive product testing is so important. Imagine if a particular charging station has 499 5-star reviews and one 1-star review (the lowest rating). The average shopper will see an overall rating that is very high. However, if the one poor rating represents a customer whose charging station started a garage fire, statistically that’s a huge problem, when you consider how many charging stations are sold each month. Unfortunately, this is exactly what we found on Amazon. There are charging stations for sale without safety certifications that have a high overall customer review rating and a handful of 1-star reviews claiming that the products operated very hot, worked for a while before acting up, and even burst into flames. In North America, UL 2594 is the primary standard for Electric Vehicle Supply Equipment. 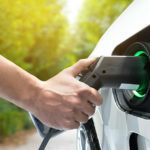 To ensure that a charging station adheres to the construction and operational guidelines in the standard, manufacturers will send samples to one of the Nationally Recognized Testing Laboratories (NRTLs), such as Intertek or Underwriters Laboratories (UL). Once a product passes all of the tests, the NRTL will issue the product its mark – for example, the familiar UL mark, or the ETL mark for Intertek. Only products which bear one of these marks, or the mark of another approved NRTL, on or near the rating plate, are safety-certified. NRTLs will also inspect the charging station manufacturer’s factory four times a year to ensure the products being sold are constructed in the same manner as the samples that were tested. Changes cannot be made to the products without going back through the certification stages. It’s quite an exhaustive process, but it’s absolutely critical in order to ensure that charging stations operate safely in every imaginable circumstance. That’s why most major retailers require it for all products sold in their stores – it protects them from liability claims. Also, most state and federal tax incentives are only available for safety-certified stations, and all the EV builders strongly recommend that you only use NRTL-certified charging stations with their plug-in cars. In the US, there are no federal regulations that require all electrical products to be safety-certified. However, there are different regulatory agencies that may require such things. For example, the Occupational Safety and Health Administration (OSHA) requires that any equipment workers are exposed to must be safety-certified. Even if you live in an area where local ordinance requires a permit, and requires a safety-certified charging station to be installed by a licensed electrician, it’s really easy to skip that step with a do-it-yourself garage install. You can simply buy any product you want off the internet and install it without ever pulling a permit. “Unfortunately, there is minimal oversight or enforcement in a lot of these cases,” explained Byczek. After seeing that safety ranked so low in the minds of buyers, ClipperCreek decided to produce its safety buyer’s guide video, to warn customers that there are many options available online that are not tested and certified. Not only are these available, it’s often very difficult to determine which products are certified and which are not. While products that are certified will carry the mark of the NRTL that tested it, there is no clear indication on Amazon whether or not each product carries the mark. It’s up to each individual seller to include statements about certifications in the product description. To make matters worse, products that are not safety-certified are often described with statements that mislead shoppers into thinking they have been tested. Phrases like “this product follows all EVSE standards,” or “this product was designed to and is compatible with international EVSE standards” can easily confuse a buyer. If those products were actually safety-tested and certified, the statements would read something like: “this product is safety-certified and listed by UL,” and would carry one of the NRTL-approved marks. The difference in wording is subtle, but hugely important. It’s as if a car company were to claim, “We’ve designed this car to the highest safety standards,” but never actually sent the car to a government organization to crash-test it. The claim has never been verified, so who knows if the car is safe or not? When a charging station is tested and certified, the NRTL that issued its mark will list the product on a publicly-accessible web site. However, when we went looking for this information to compare it to the products available on Amazon, it was not a quick or easy process. It took about an hour for us to figure out where to find the right information and compile a list of all the safety-certified products listed on the Intertek and UL web sites. And on the web sites of other NRTLs, for example MET Laboratories, you can’t search for every product that’s been certified to the UL 2594 EV charging station standard. Instead, the site requires you to enter a listing number or brand name for each product one by one, which is even more tedious. It’s totally unreasonable to assume that the majority of consumers will go through this process when shopping online for a charging station. So, it’s very important for the EV industry to pressure the majority retailers – like Amazon – to only carry products that are certified to be safe. Unfortunately, approximately three weeks after we first reached out to Amazon there are still many charging stations for sale that have not been safety certified. Safety Certification is good (and very expensive) validation a product meets a certain specification. However you can not conclude a product that is not tested by UL or ETL (for profit companies) is unsafe. This article falsely makes this assumption with absolutely zero evidence of actual safety issue. Smaller companies may not be able to afford the insane price of certification and quarterly inspections, that does not mean they build an unsafe product. Then why campaign to ban all non-certified products from Amazon? Seems unfair to products like OpenEVSE and JuiceBox which are both not certified but have a great track record of reliability and safety. We think it’s vital for the EV Industry to make it clear that there is an important difference between charging stations that have been safety tested and those that have not been tested (or haven’t passed). That information is not easily available to the average consumer when shopping online. We think that as a big problem. For the sake of disclosure… Are Clipper Creek and Intertek paid advertisers of Charged? Got it… That really explains the tone of the article. Yes, past and present. Along with dozens of other charging station and EV components manufacturers of all types. Including plenty of companies that, like you, are also not thrilled with “tone” this article. Yes, I agree it is an important topic and consumers should know if a product is listed or not. However I disagree that unlisted products should be banned from Amazon. Just because a for profit company has not tested a product does not make it unsafe. I could argue the details of a charging station hardware and firmware must be fully open source otherwise it can never be known if it is safe. Open designs are seen by many thousands of engineers, closed only by a select few. Tested does not mean 100% safe and Untested does not mean dangerous. Of course tested does not mean 100% safe, and untested does not mean 100% dangerous. However, it’s not reasonable to assume that consumers and retailers, like Amazon, are going research the open design of chargers on a regular basis. They’re not engineers. It’s not their role. So how do you stop the constant flow of imported foreign products of questionable quality being sold at high volumes to shoppers who don’t realize what they’re buying? We’re talking about the top selling products on the world’s largest online retailer. In a future where EVs are mainstream, there needs to be a simple and clear system that retailers can reference. If not NTRL certifications, then what? What other benchmarks are there? Both @disqus_v6m16nTYLB:disqus and @ChargedEVs_Admin:disqus have valid points in this. Certification is a slow and expensive process that almost necessarily prevents rapid design improvements associated with open content or Agile or fast iterative design processes. With CNC and semi or fully automated manufacture and assembly of electronic components being the norm for even moderate volumes, rapid design changes are easily implemented within tight specification and control, meaning there isn’t a strong manufacturing advantage for long iterations. Even so, OpenEVSE surely appreciates that while their product is thoroughly looked at by many bright engineering minds and constantly scrutinized, many of your uncertified competitors do not have the same situation. There seems to be a need and a demand for a certification process for open or rapidly iterative products. Perhaps a systems allowing appropriately licensed engineers to certify through simulation, duplicated physical testing, and/or engineering calculations. Certification can be limited to that certain requirements are met by portions or all of a system/component. If the sum total system including variations and effects through connections and shared environment can be checked, then this can be an effective ‘open’ certification. There would absolutely need to be a combination of ‘crowd’ or peer reviewing, use of existing licensing or other methods for verifying the source engineers, etc. Additionally about the open source software topic. Software written to meet the UL2594 requirements must be built and certified as functional safety software under the UL1998 standard. It is created in a very special way and validated in detail by NRTL software experts such that it can handle multiple faults to address the risks of fire and electric shock. After certification, just like hardware changes, software changes are not allowed without re-certification. The idea that an open source software is safer is simply not true. Would you like your pacemaker software to be open sourced and up-gradable at any time, written by anyone who wants to give input? How about the autopilot software flying the plane you are in? It may be possible for a company utilizing your components to go through the UL process with a fully built assembly, and get certification, which would be proven by the right to apply the safety mark on that end product. ClipperCreek is not against open source systems, we think they are great for many applications, just not functional safety software in EVSEs. It is absolutely proven that the OpenEVSE open source design hardware and firmware does pass UL testing including UL2594 and UL1998 in Wattzilla Uno, Duo, Quad, Waltzilla, Wall Wattz and Black Manba. Open vs Closed has no bearing on absolute safety, the same as listed vs not listed. The license and availability of source code is irreverent, a pacemaker or autopilot can be safe with an open license. Obviously medical devices and aircraft components require extensive testing. There was recently a really big vulnerability discovered and several lawsuits with pacemakers, had more people seen the source code the issues may have been discovered before the device was implanted in millions of patients. Closed and tested does not provide absolute safety. The Safety of a product is absolutely dependent on the design of the device. There are listed devices that are unsafe and unlisted products that are safe. I think a good analogy to use here would be the construction an apartment building. Let’s say a small company wants to build an apartment building. But they decided not to have any inspections done (building, fire, etc.) because they decided that they do not have the budget. Would that be okay with you? Would you move your family into a building if you knew it had never been inspected? Of course, one would assume it had been inspected and was built to modern building codes. ClipperCreek feels it is important to raise awareness to the general consumer who may unknowingly buy a product that is not NRTL certified, which is why we created the video. Every appliance in mature markets are NRTL certified. In reading the Charged EV’s investigative article, it seems to also be intended to raise awareness. It’s a company’s responsibility to manufacture, test and certify that their products meet the requirements that have been established. It’s not an area to skimp on for any business. Get your products NRTL certified. You claim they meet the standards, then it should not be a big deal. The idea that it’s OK for you to potentially endanger the public because you do not have the budget is unethical. Also, it seems like you would have the budget if you have sold over 10K charging stations and controllers. This is a matter of public safety. Buildings, airplanes and medical devices are a lot different different than a power cord. It is great that Clipper Creek has the resources to certify many products. OpenEVSE is a community devolved product that has pushed Charging Station technology (including safety features not required by UL specs). OpenEVSE components are used in both UL certified products such as Wattzilla Uno, Duo, Quad, Waltzilla, Wall Wattz and Black Mamba (more on the way) and in non-certified products and kits. As soon as NRTLs offer certification for individual EVSE components at a reasonable cost we will be in the labs for testing. I applaud your customer, Wattzilla, for being a responsible company and selling NRTL certified stations. Open EVSE should follow suit and get certification on the products and components they sell. NRTLs already offer reasonable costs for certification of individual EVSE components. Email me and I will send you contact information so you can get a quote. The NEC unequivocally requires charging stations to be NRTL certified for public safety. The certification standards are well established and followed by all responsible companies. There is no excuse to cut this corner. It is the law. It is not negotiable. How do you not understand that? It is not the law. UL is a for profit company. There is no law that says a product must be UL listed. Buildings and their electrical systems must be permitted and built to code, many local and state ordinances require compliance with NEC indirectly making it a law, however there is no law that says plug in devices must be listed. Safety certification is not a bad thing, but UL and the testing labs write the standards and then make a profit on the testing. there many state and local statues which make it the law that all mains powered devices be certified by an appropriately accredited certification organization of which UL is one. OSHA makes it a federal requirement for any device used in a workplace, so you see it is actual required by law for most uses. the items you talk about are all powered by a safe low voltage and as you state do not require safety certification however if you look closely at AC adapter that powers them you will find a safety certification mark. building you own computers from parts is OK because the AC mains connected power supply will have a certification agency mark, Oh by the way I have worked product safety and certification field for twenty years. What is your expirence? I am the cofounder and primary designer of the OpenEVSE open source EV charging controller. I also run the OpenEV Store, which sells EVSE kits, controllers and parts used in both unlisted and listed devices. I have assisted with the UL certification of half a dozen EV charging stations and have a handful of stations by 3 different manufacturers in UL, CE and ETL currently undergoing certification. National Electric Code NEC is required by local ordinance, which covers the electrical systems​ in the building. SAE J1772 is a recommended practice and the UL standards that apply to charging stations are not codes or laws. The only grey area is NEC requires hardwired stations to be listed. This does NOT apply to corded stations. The power supply module (in addition to every part that touches AC power) in OpenEVSE kits​ is UL listed just like a PC power supply in your example. Using your logic OpenEVSE would be just fine as all high voltage parts are listed. However this is not enough to be listed, the device as a whole must be certified. A PC built from parts, 3D printer and electronics kits are not UL listed or illegal even if the power supply is. But it’s OK if they downloaded plans from the internet, because some open source buildings somewhere were approved, all buildings that were based on those plans must automatically be safe. In North America an NRTL safety certification is required to legal connect to the mains network. So Amazon is using their economic size to ignore the law. Not very reputable. In Canada it is governed at the provincial level while in the USA it the state, and local city levels. NRTL certification is not a legal requirement. Your statement is false. Well ,then it is buyer beware, and you are on your own if something goes wrong. And oh yes if your insurance provider finds out they may deny the claim! Do you want to take the risk I for one don’t. In North America an NRTL safety certification is required to legal connect to the mains network. In Canada it is governed at the provincial level while in the USA it the state, and local city levels. Your statement is False. NRTL certification is not a legal requirement for plug in devices. Dozens of OpenEVSE kit builders have called their insurance carriers in both the US and Canada, in all cases the response was the same. The electrical system in the building must must be permitted and meet local and national code. Plug in appliances did not require NRTL certification to maintain coverage. Please, call your own carrier. As someone previously involved with Printed Circuit Board Design for this company, I can assure you they take every consideration in the name of safety in their products, as well as tight compliance with any and all ETL, UL, IPC, SAE, and/or Customer required design parameters and specifications. It’s wonderful the unit is designed to be safe. Until the unit has been tested by an independent laboratory, it has not been proven to be manufacturied safely and to operate safely. People should be informed if they are risking their life and their home if they buy a product that may catch on fire due to either poor design or manufacturing. As well as it’s listed in the article, any changes to design or manufacturing requires new certification. It’s great that @disqus_h4uSLAMCqk:disqus was involved with the company, but things may have changed since his involvement and could have affected the product’s safety. Indeed. any change whatsoever, not only in the product itself, but even generic component substitution, or change in suppliers for a PCB, or a different assembly procedure, and the Ratings Agencies must be notified. They then determine if the product then warrants re-certification to maintain their ratings, or if the change make no difference, and retesting is not required. Yes. and many people do not understand the entire certification procedure. It does not only involve the physical testing you mention, but also an audit of the design principles and procedures used. Everything in the process, from inception of the idea, design, manufacture, marketing, even end use instructions, is relevant to the overall safety of the product. Physical testing/certification is only half the story. All of this adds the cost of the end product. But you want to know the REAL reason? Liability. This makes the manufacturer’s product liability insurance much less expensive. If due diligence is given to safety and certifications, the exposure to liability lawsuits is greatly reduced. And if a manufacturer is smart enough to have ETL and UL ratings, it is far more likely they have product insurance as well. A small manufacturer that produces a product that damages your property will likely not be able to pay a judgment even if they lose in court. In fact, other businesses, and the government, will not even consider a purchase of a product unless it has at least one recognized certification, no matter the cost savings. I was by the Camas UL last week to check out a PlugShare listed L2 and it looked almost abandoned with only 3 or 4 cars in the whole parking lot. Odd. And yet, Clipper Creek, themselves, sell numerous portable Level 2 EVSEs… none of which are technically permitted by the NEC for safety reasons – although they are listed by an NRTL. Furthermore, it doesn’t take very much investigation to find that NRTL-certification on EVSEs does not assure that you won’t have an electrical fire. For example, Bosch Power Express EVSEs have caused garage fires, and they are UL listed. Furthermore, you can find fires caused by OEM EVSEs sold with Ford CMax Energis and numerous melted/burned 110V outlets charging Chevy Volts… and those EVSEs are all NRTL-listed. Of course there have been many safety incidents in the past with EVs and charging stations of all types. Too many. The goal is to steadily reduce those occurrences overtime through better engineering, standards, testing and certifications. Lee, The National Electric Code (NEC) most certainly DOES allow portable Level 2 EVSEs and by the very virtue of being NRTL listed we are compliant. (refer to NFPA70-2017 edition, NEC 625.44a if you’d like to read more). Burned outlets are more likely the result of old wiring not up to code, or too many things plugged into that circuit at the same time. Or it could be as simple as someone plugging/unplugging their EVSE everyday, and wearing out the connections. The NEC changes the rules on plug-and-cord connected EVSEs, you may have entered a temporal anomaly. The safety discussion is a statical one, what you get for having a listed EVSE is confidence that your insurance claims will not be denied because you used a cheap piece of unsafe (unlisted) junk that you bought because it was the cheapest thing on Amazon. End of story. It buys you risk management. And lower risk. This article neglects to discuss the high cost involved in said certifications. If it were free, I’m fairly confident few products would be uncertified. There is a false theme here that assumes the cost for NRTL listing is unreasonably high. This is simply not the case. As the President and the Director of Engineering for ClipperCreek, I have personally been involved in the process of getting NRTL certification of EVSEs dozens of times dating back to the early 1990’s. The cost of certification is far less than many other basic R&D startup costs including salaries, tooling, and manufacturing capacity development. Cost is not the obstacle for many of the stations researched in the article. They are manufactured in China by large companies. The “products” would not be certifiable because they could not pass since they are constructed with less than the minimum required functions and performance. Why should anyone do it for free? Do you work for free? White papers and standards are frequently free (or extremely low cost, i.e. Micro SD cards) as a way of propagating said standard. UL is a barrier to entry by design, since the premise is to ensure safety. I am sure their products are designed well… so just go get them approved by intertek or UL. The fact is non-UL rated chargers have been proven to be safe, without the UL rating. If they are not please provide proof of what non-UL rated charger caused an issue. The U.S. rating company simply wants to be paid thousands of dollars to test and certify, and those that paid the UL rating company want to squeeze out products that did not pay the UL companies. The products are often tested in the Country of Origin and have safety rating approvals. I saw someone posted Wazilla, a U.S. company, it says on their page. UL recognized, not UL Approved. I would have no problem buying their product UL Approved or not. I have personally tested numerous chargers lke Yocar, Zencar, Dousida, etc. and found them reliable and safe. So again, if someone has links to documented device failures, overheating, etc. Please post the link to those documents. Would like to read them. Don’t just jump on the no UL rating band wagon. Also Amazon is allowed to sell non-UL rated products. U.S. law absolutely allows non-UL products to be sold. It is all about insurance. Insurance companies are basically statisticians. Between the National Electrical Code and UL / NRTL certifications, the insurance companies know they can insure your home at a reasonable rate. If you don’t have someone at a NRTL checking to make sure that that charging cord will not wear through and expose the copper after it has been dragged across your nasty driveway concrete for ten years, they can’t be sure you house is not going to burn down. So if you want to buy something that is not listed, then be prepared to have your insurance company deny your claim when someone gets electrocuted or something catches fire. They do have armies of lawyers for just that purpose. You decide, OK? Meanwhile, this system has given the USA some of the lowest rates of accidental electrocutions and fires of any developed country at the lowest total costs. So go hug a statistician. Well this is interesting – that Ebusbar BEV-H02A10 is completely removed from Amazon (Item Not Available). The reviews still stand – you can find them with Google search. The seller has removed the listing – when a product is out of stock, the listing stays even though you can’t find it with a product search within Amazon. This one is different – even Google links to the product listing are dead. Unfortunately this product has been discontinued and we will not be receiving any more stock. What’s to stop any Canadian from buying this on Amazon or ebay and installing it in a Canadian home? Perhaps the Canada’s safety regulators NEED to be alerted to this real risk if this kind of Canadian Public Safety and Property hazard from being sold to their citizens. I have a Clipper Creek HCS-40. Love it, Very happy with it. 36,000 miles charged with it so far. It’s funny to see how Charged EVs is clearly catering to the Clipper Creek, Sponsor, with this article. Clipper Creek is great at marketing the robustness of their product, Safety, ease of use. All very well done and as a customer I agree that they have a good product. But this is really a marketing stunt by Clipper Creek disguised as an article written by Charged EVs. So let’s not pretend shall we..